New Report Finds Climate Change Already Having Broad Impact : The Two-Way A report overseen by the government finds climate change is causing more frequent heat waves, floods and droughts. The change, the study concludes, is also disrupting key parts of the economy. 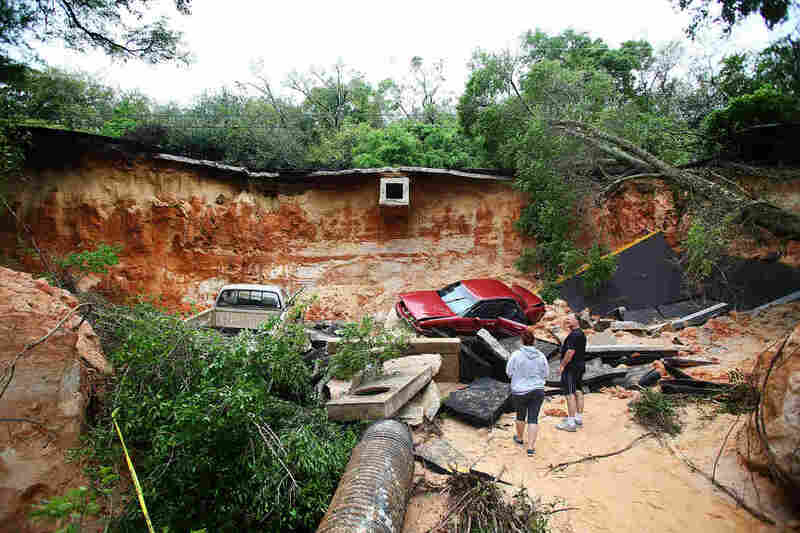 People survey the damage on Scenic Highway in Pensacola, Fla., after part of it collapsed following heavy rains and flash flooding on April 30. A new U.S. government report released Tuesday finds that climate change is already having a broad impact on both weather and the economy. NPR's Elizabeth Shogren tells our Newscast unit the third National Climate Assessment is the most comprehensive look at climate change that the government has ever produced. It was put together by more than 300 experts "guided by a 60-member Federal Advisory Committee." "The report finds climate change is causing more frequent or intense heat waves and downpours. In some regions it's causing more floods or droughts. Climate change already disrupts key parts of our economy — energy, transportation, agriculture and water supply. One of the authors, University of Arizona professor James Buizer, says the biggest change from the government's last assessment is efforts underway to reduce greenhouse gases and adapt.
" 'People are already starting to act, preparing for the climate that will be, not the climate that was,' he says. "But the report says these efforts so far are insufficient to avoid increasingly negative impacts." One of the differences between this report and its predecessors is that scientists have become more confident that human activity — specifically the burning of fossil fuels — has driven most of the warming in the past 50 years. 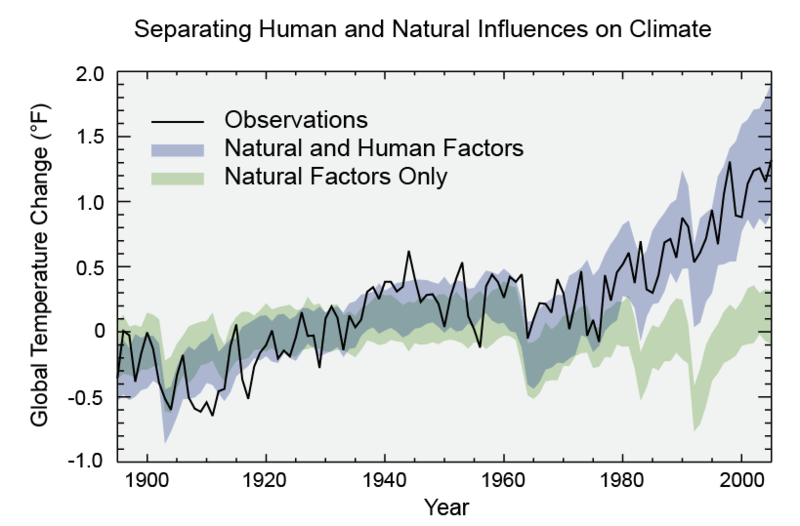 A graph showing warming caused by natural and human factors. 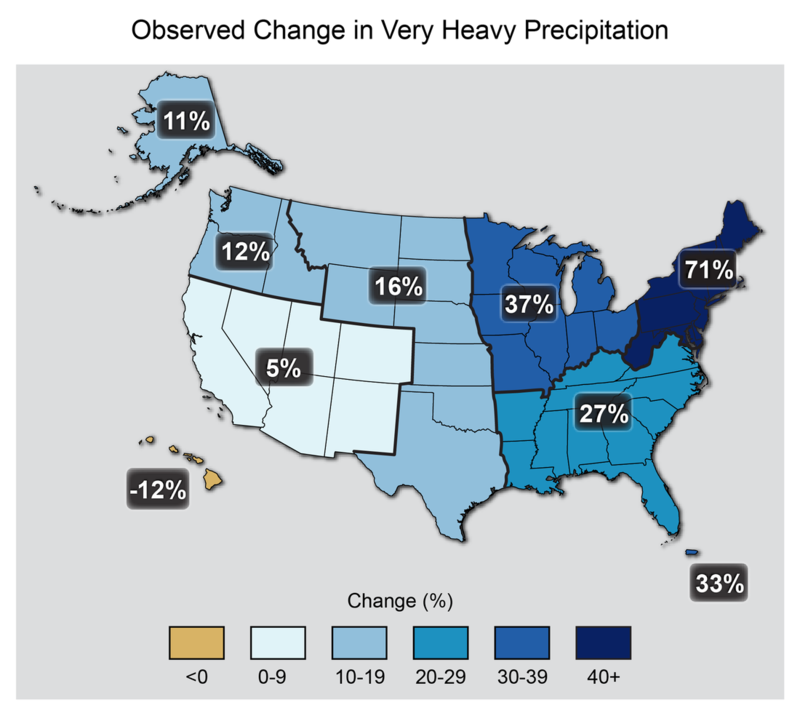 Percent changes in the amount of precipitation falling in very heavy events (the heaviest 1 percent) from 1958 to 2012 for each region. "The report was unveiled at the White House, and President Obama planned to spend part of the day highlighting the findings in interviews with television weather forecasters around the country. "Some Republican members of Congress have contended that the science of global warming is a hoax perpetrated by a global conspiracy of climate scientists, a point of view Mr. Obama has mocked as comparable to belief in a flat Earth. Other Republicans concede that climate change caused by human activity is real, but nonetheless fear — as do some Democrats — that the president's policies will destroy jobs for miners and hurt the broader economy."